In the winter of 2013-14 there was a great gale in Pembrokeshire with very strong winds from the west. A lot of big old trees were blown down all lying with their roots to the west and their tops to the east. 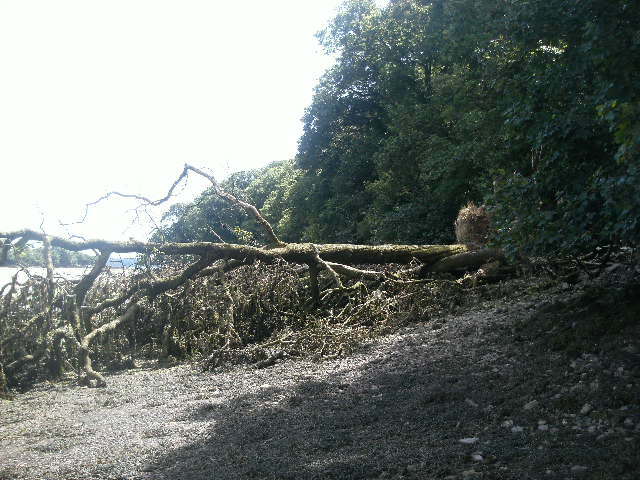 Along the side of Sandy Haven tidal inlet, where The Anchorage small holding includes a 250 m section of the coast of Wales with the banks heavily forested, ten big trees came down. Some of them brought much rock and soil with them and left them with their roots on the banks and their branches reaching out into Sandy Haven tidal creek. They don’t look nice like this and the branches soon become festooned with seaweed. 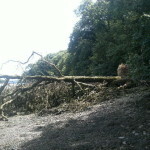 The fallen trees prevent boats and walkers from following the shoreline. However wood is much needed by the many people who use wood burning stoves and in the old fireplaces in the older cottages (called biomass nowadays). However ten trees require a considerable number of hours of chainsaw work to reduce them to logs and then there is the problem of getting them out of the creek. However it was not long before I was approached by some of my neighbours asking if they could have the trees for logs. I happily agreed as there was a lot of work involved. For example when I bought The Anchorage plot in 1982 one third of the trees were big elms that had recently died because of the beetle that came from Canada. It killed off most of the elm trees in the UK. It took me working alone twenty years to log my dead elm trees and burn them as firewood. Their trunks were so big that I hired a chainsaw with an extension on it to slice up the big trunks. 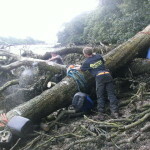 My neighbours work with a boat and cut through the trunks of the thinner trees and then tow them to Sandy Haven beach near The Anchorage. 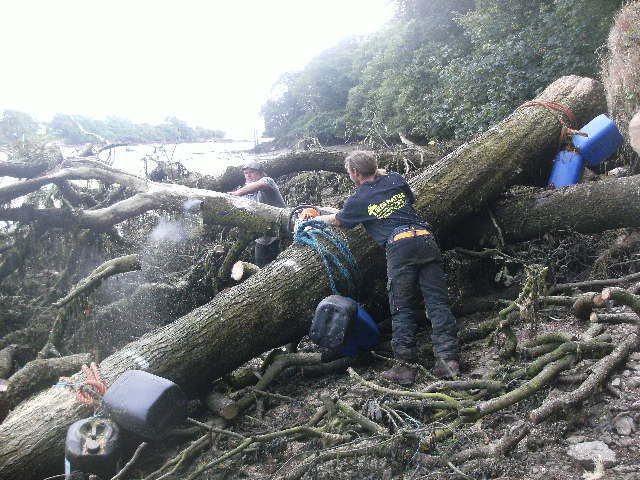 There they saw them up into logs on the beach and take the logs out by trailer along the public road. Two years later in summer 2015 I went along the creek to see the progress and was disappointed to find 6 of the trees still there. In particular there was one very fine tree – a big oak tree – with a magnificent straight section of trunk twenty feet long and twenty five inches I diameter. This was too big for the firewood operation. It looked to me to be a fine source of oak planking. I knew it was an oak for it was still alive and put out small shoots with oak leaves on them in the summer of 2015. Now on the old Dale aerodrome there is a sawyer with a set up to plank twenty foot logs. I knew him as some years previously I had taken four fir trees to him for planking. The seedlings were bought in Woolworths and planted in The Anchorage garden where a line of giant elm trees had stood. But after 25 years they were so big they were shading much of the garden. The sawyer said I was the first customer who had brought him logs grown from trees that he had planted. It would be nice if The Anchorage had a gazebo in the garden where people on wet days can picnic and meet outside the house. So the big oak tree would provide the wood for this at a very affordable price. I met my wrought iron craftsman friend in Haverfordwest (who made the entrance gates and the nautical mailbox) accidentally and he sounded most interested in making for me the iron fitting to join all the pieces together. So in summer 2015 I decided to go ahead with the project. A study of the big oak tree revealed that it was lying on top of two other trees (with shorter sinuous trunks and there as a real tangle, but the roots still anchored them in a tangle of slipped rock. The cutting job to release the 20 foot trunk was too difficult for me with my two small chain saws. So I went to a local tree surgeon (Ben) who had removed for me (in early 2015) two large trees that had overhung (from a crumbling bank) The Anchorage – an action requiring permission from the National Parks. 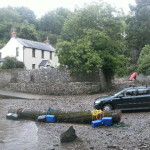 There was a four day slot at the beginning of August when Spring tides of 7.4 meters would nicely flood Sandy Haven creek to lift off the log. Then on the outgoing tide I would paddle it like a canoe to our local beach near The Anchorage. 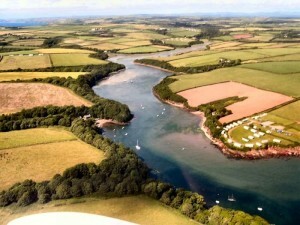 However Ben and his partner were busy and available only on the very last day of spring tides, so the date was set – Tuesday August 4th 2015. The tree was still green with live shoots and leaves and I was not sure if it would float and carry me as well. So on the day before the cutting, I took coils of rope and 12 empty hypochlorite drums (used to clean the asphalt and patios at The Anchorage of green winter moss and algae) to the tree. The drums were lashed in groups for four to either end and the middle. The tree could not move as its roots were still embedded in fallen cliff. Tuesday August 4th proved to be a cloudy blustery day with grey sky and rain showers. 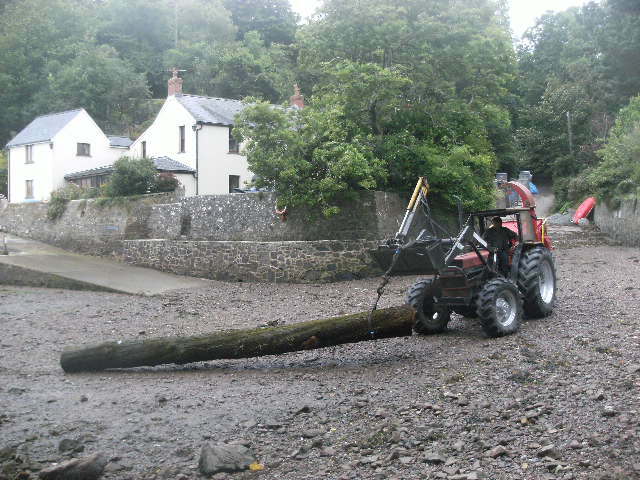 The tree surgeons and I met at the tree at around 2.0pm, when the tide was out and the creek dry. It took the two of them three hours to cut the tree trunk free and sever it from the tangle of branches and other trees. Then I left and had to return for the last of the spring tides at 10.11 pm that night. Unfortunately it gets dark at 9.45pm at this time of the year in west Wales. So at 9.30 pm in the dusk I was back at the tree with two coils of rope to moor it until daylight next day. Regrettably it decided to rain so I waded to the tree with my ropes and tied them to each end. One end of the log remained propped on top of another tree but I took a long branch and used it as a lever and managed to slide it off the log underneath into the sea. Then it was a matter of pushing it a hundred yards up the creek away from the tree branch tangle and mooring it at both ends to overhanging tree branches for the night. By then it was dark and it proved a slow job getting out of the creek with what proved to be a fairly feeble torch. Dry clothes awaited me in my car that has a good heater and I went home for the night. Next morning I was back to catch the high tide at 10.30 am. This tide was about 40 cm lower than the last spring tide of the night before. But as the log was now moored it was free of the tangle of branches and trunks where it had lain. I unmoored it and climbed aboard and was pleased to find that it floated with me on top, although the whole tree was just submerged with the buoyancy drums only partly above the water. The 12 empty drums kept it afloat and prevented it from rolling. Now in August the weather can be lovely for canoeing in Sandy Haven at flood tide. 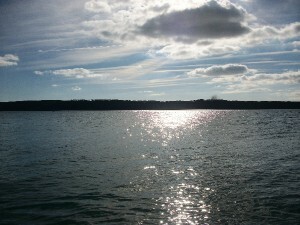 I had hoped for a balmy day with sunshine, and calm clear blue water. However the BGIS (Big Geologist in the Sky) had other plans got me. As I was approaching 72 years of age I think he had in mind to test me. It was pouring down with rain, the sea and water were grey and a strong wind was blowing up the tidal creek. I found the log immensely heavy to paddle and progress was very slow. The main channel was on the opposite side of the creek to where I started and on my side there is a weak counter current as well as the strong wind blowing against us. The log was so sluggish that there was no possibility to cross the creek and get into the main current. The only option was a long steady slog along the creek (clear of the remaining fallen trees) to approach the outgoing current as it passed the small headland at Sandy Haven beach. This took over an hour and every time I stopped paddling we would be blown backward. Waves were breaking against the blunt end of the log and riding along its length. I was completely wet in old clothes, but the water did not seem very cold. It would have been just over 16 degrees Centigrade as that is the temperature at which the bass fish enter the haven and they had arrived. After an hour the curtains of misty rain that had been coming up Sandy Haven creek ceased. A second improvement then occurred before I reached the rocky headland that I had to pass around to get to Sandy Haven beach. The headland sheltered me from the wind and the paddling became more effective. Finally as I reached the headland we got into the outgoing current. Here the water was moving rapidly down the creek with the wind blowing up. 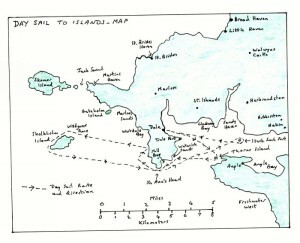 The channel of moving water was distinct because the wind kicked up white capped waves against the out going water. I sat the log and watched our seaward progress against rocks on the opposite side of the creek as they aligned differently and moved behind us. Finally I could see into Sandy Haven beach – the hard pebble beach just below The Anchorage. A bit of hard paddling brought us out of the current and I turned us into our small bay. Then the wind took over and pushed us in onto the beach. 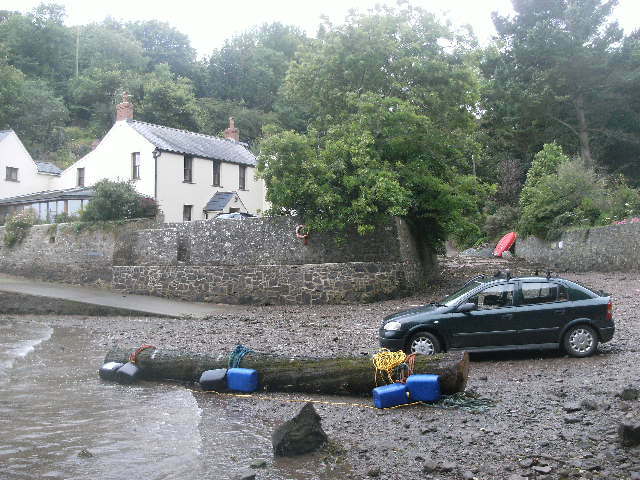 There was no need to moor as the wind held the log onshore and the tide was dropping rapidly. I went to my car, changed into dry cloths and called my tree surgeon friends. 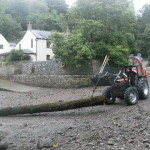 They soon turned up with a JCB and dragged the log up our road and into the garden of The Anchorage. I took photographs of the cutting free of the big log and others when it was on the beach. But there was no way I could take a camera on a submerged log on a rainy day. Some of these photographs are shown here. Finally I went up to my farmer neighbours and told them I had taken the big log but left many smaller sawn branches that would make logs for their winter fires. They were very happy and said that the tress cut last winter in the creek had kept them warm.